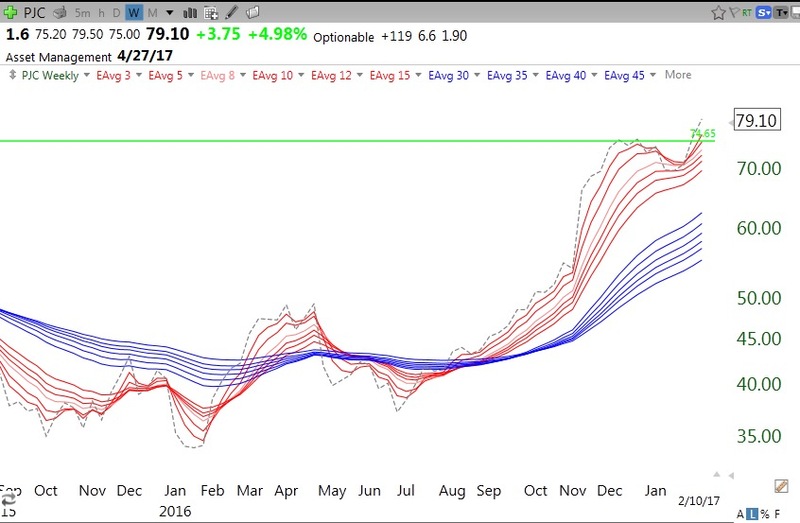 I created a scan in TC2000 that looks for strong stocks hitting a 100 day high that did not hit a 100 day high the prior day (I want a stock to be just breaking out), that is up significantly from a year ago and that traded an above average number of shares that day. This scan identified 19 stocks, of which PJC is one. I like the the technicals and fundamentals of PJC. It also has a Composite Rating in IBD=95. 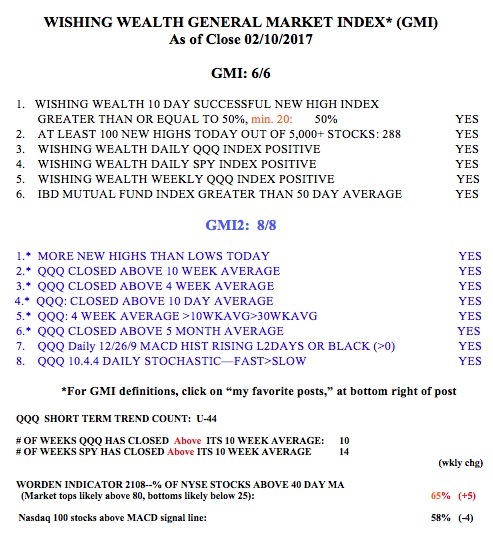 You can access this scan in my TC2000 Club at www.wishingwealthblog.com/club. The scan is also described in my blog’s glossary above. I use the results of my scans as a starting point to identify strong stocks that I must then research for other technical and fundamental attributes. 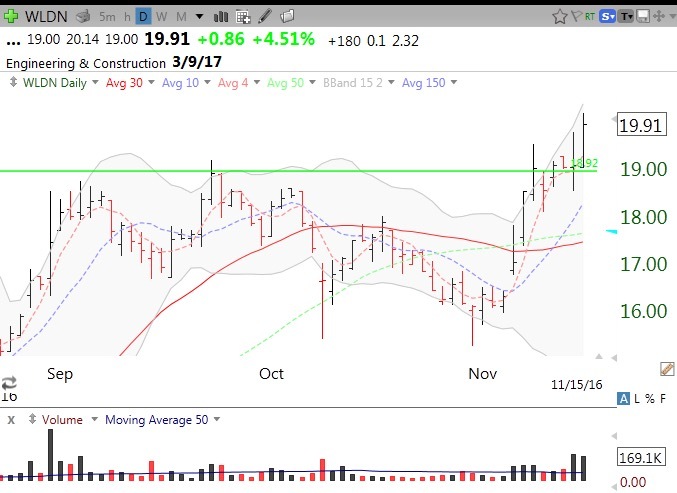 I like to run this scan during the last hour of the trading day (I do not want a stock that breaks out early only to reverse by the end of the day) to find stocks breaking out on above average volume. If I find one I like, I might buy an initial position and place a sell stop below the day’s low. Here are some charts on PJC. 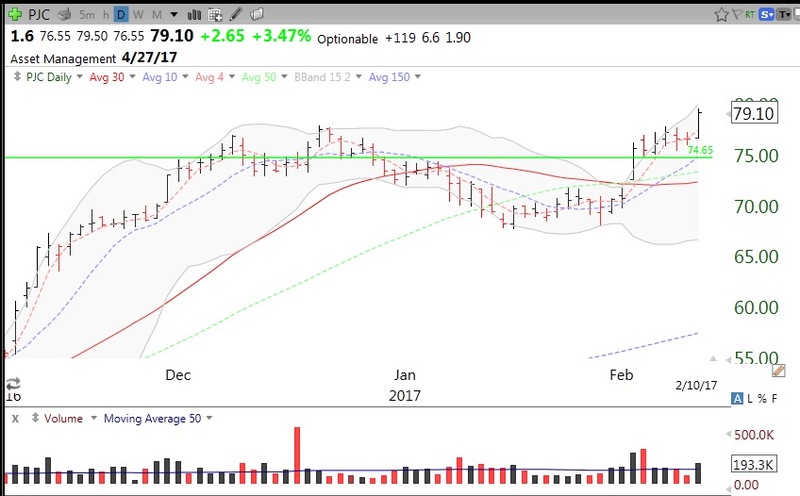 This weekly chart indicates a GLB (Green Line Break-out to an all-time high, see Glossary for definition). 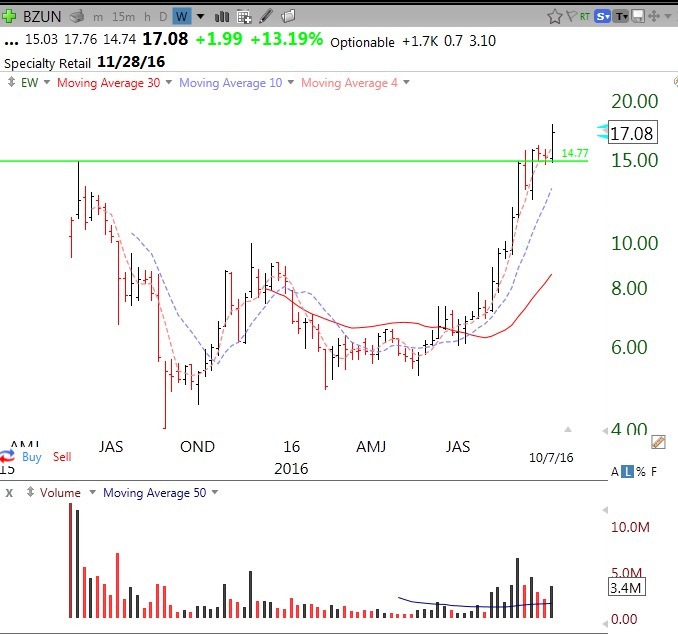 The daily chart shows the increased volume on Friday. This might be also be considered a cup with handle break-out. The weekly chart shows an established RWB rocket pattern and a break-out from a base. 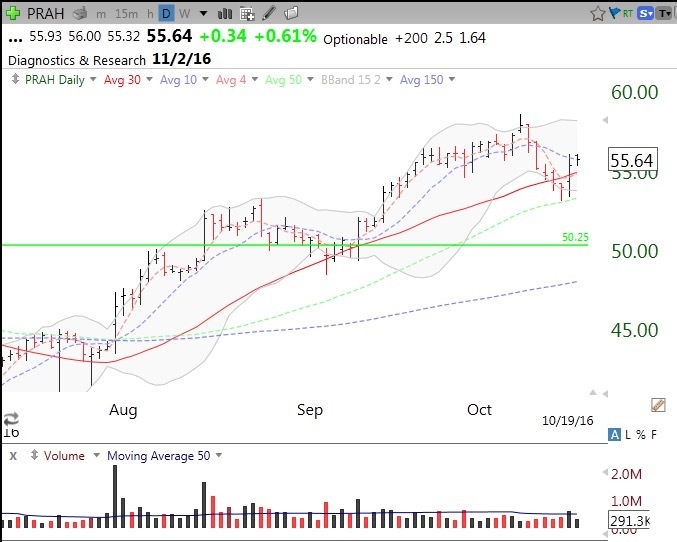 WLDN continued through its green line top to an all-time high with above average volume on Tuesday. I took an initial position. WLDN has a 99 composite rating from IBD. Note the triple digit earnings increases and that it has already doubled. I just spent 3 days in Myrtle Beach, South Carolina, at an intensive 3 day workshop for committed stock traders. 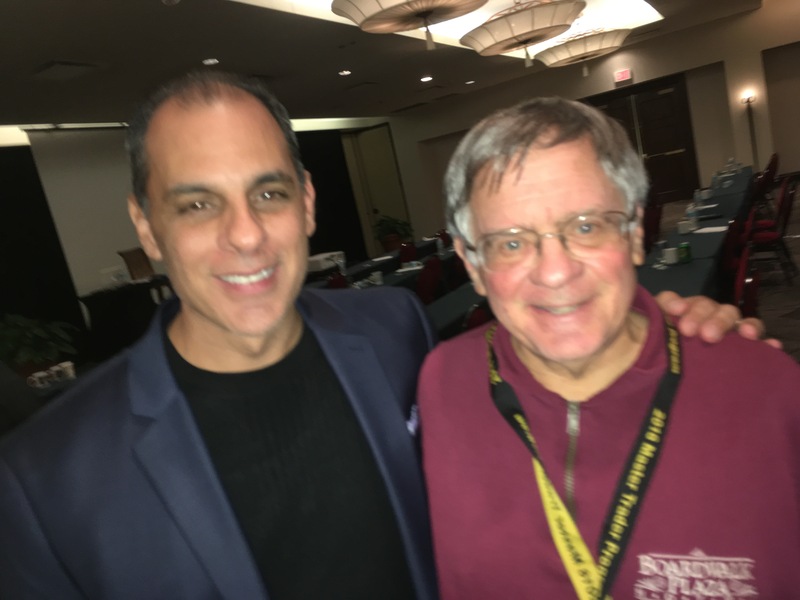 It was a privilege to spend time with two of the greatest stock traders, Mark Minervini (above) and David Ryan. They taught the attendees what they had learned as they amassed their fortunes in the market. I had read Mark’s book, listed to the right, and was impressed with his trading strategy that draws upon stage analysis and his own brand of stock trading. I had also admired the writings of David Ryan, William O’Neil’s protege, and require all of my students to read his wonderful chapter in Market Wizards. While I was expecting to learn a lot from these masters, I was not prepared for the compassionate and decent human beings that these two men are. They greeted me and immediately offered to present a lecture (by Skype) to my students. They both are dedicated to educating young people in financial literacy and in how to manage risk in the stock market. And if that wasn’t enough, I was amazed to see how many of the traders came up to me and thanked me for teaching technical analysis to students at a university. The personal qualities of the attendees was far beyond anything I had expected and created a warm and receptive environment for the workshop. As I left the workshop, Mark reiterated that he wanted to begin teaching my students as soon as possible–wow! The first two days (Saturday and Sunday) we spent almost 12 hours each day listening to Mark and David. We could have been just as easily in a desert rather than a beautiful and fully supportive resort hotel. All were totally focused on the information being presented. They showed over 600 slides that taught everything from how to select stocks, the price patterns that are most profitable, the way to set stops, pyramid up, and close out positions. They gave the best information on the value of cutting losses that I have ever seen. I also got a real feel for the benefits of using IBD’s MarketSmith service. (And no, Mark did not even once try to take advantage of the opportunity to sell any of his other trading books or services–what integrity!) Mark would not leave the training room until people had an opportunity to ask every question they had. I have never witnessed in a prestigious speaker such devotion to educating and serving every attendee. The third day (Monday) was a newly added feature. We watched Mark and David prepare for the market open, and then observed them and Mark’s associate, Bob Weissman, actually place trades. This experience gave me a unique insight into what it really takes to trade stocks profitably as a business. Monday evening ended the long day with Tony Robbin’s son, Jairek Robbins, conducting a 3-hour session on how to enhance one’s psychology and well being to enable one to handle the stresses and requirements of trading. This was also an invaluable experience. That session ended around 10:00 PM! I found that Mark has put together a program to enable people to ready themselves for trading successfully. He has put into a 3 day session much of what it took me over 50 years to learn. I may even attend again next year, as many of the other attendees were doing. I am now eager to infuse my curriculum with the new insights I gained and look forward to the day when Mark and David will present a lecture directly to my students. Thank you to Mark, Bob and David and to the attendees, my new stock buddies. 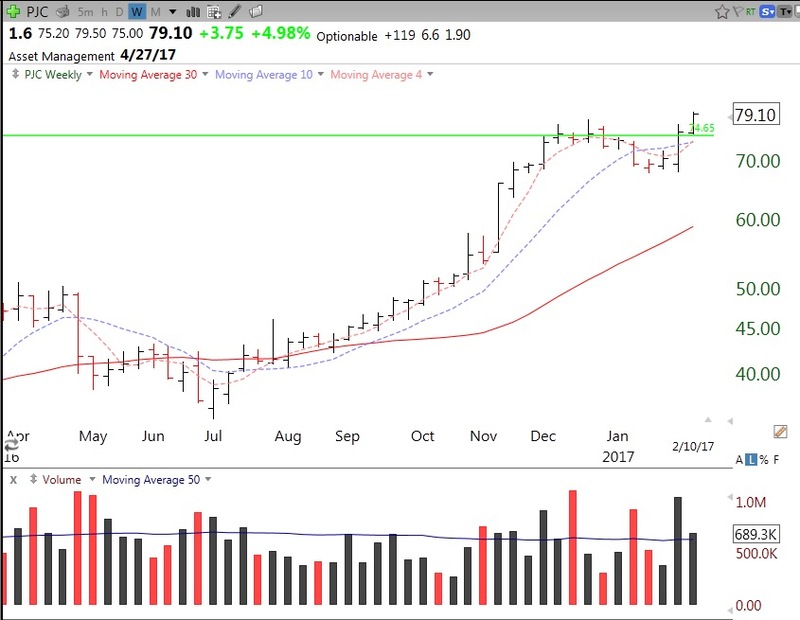 This weekly chart shows that BZUN had a high volume GLB break-out on Friday to an all-time high. BZUN has a 99 RS rating on IBD. BZUN has more than tripled over the past 250 days. 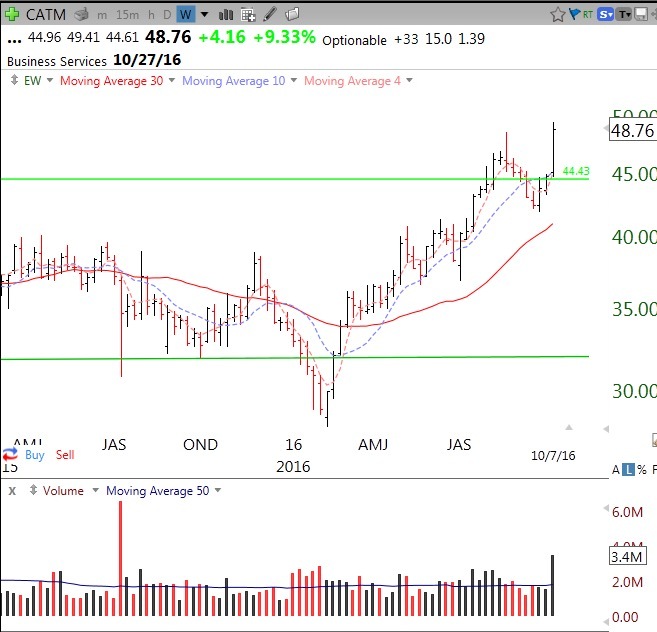 CATM also broke out last week. CATM has an IBD Composite rating of 93. I attended the free TC2000 work-shop in Virginia on Saturday. The new Version 16 of TC2000 allows trading from charts and includes options. It also allows one to paper trade right off the charts so as to test out various signals and strategies. I was amazed by what is now possible with this powerful software. Check it out! 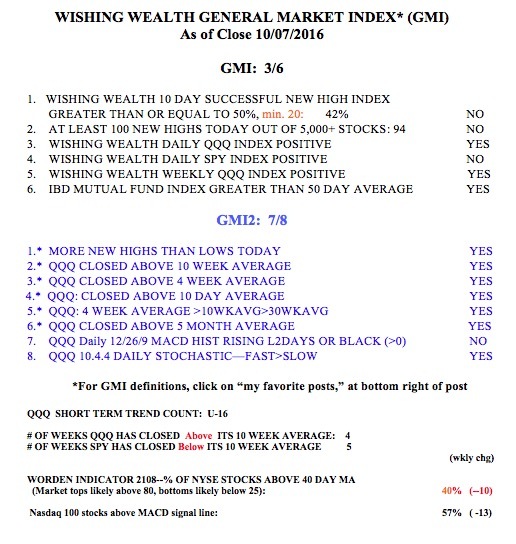 The GMI is now 3, but it is still on a Green signal.